Hong Kong is frequented by tropical cyclones (commonly known as “typhoons”) and rainstorms during the summer months. 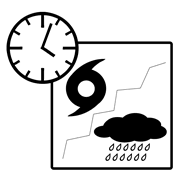 It is essential for employers and foreign domestic helpers(FDHs) to set out reasonable and practicable rest / work in the tropical cyclone warning (hereinafter referred to as "typhoon warning") or rainstorm warning arrangement. This helps to prevent unnecessary disputes and confusion, maintain good employer-domestic helper relationship. 1.advise the FDH not to go out for safety reasons, take the holiday at home and rest. 2. cancel the holiday, but work. Employer will give ee holiday replacement, or pay FDH for working in the holiday. 3. FDH still goes out for holiday. 1. The employer should advise the FDH not to go out for safety reasons, take the holiday at home and rest. Rest at home also prevent the risk that the FDH may ask to stay outside because of the problem of traffic. If the FDH agrees to rest at home, the employer shall not ask the FDH to work on the rest day. <<Employment Ordinance>> says the employer should not ask the FDH to work during the rest day. Unless the FDH volunteer to at rest. As FDH may not be able to go out under such weather conditions, employers should also provide food and drinking water at home for FDH’s consumption where appropriate. 2. The employer can also discuss with the FDH, if she agrees to cancel the rest day, to work. If the FDH agrees, the employer would pay wages, or give a separate rest day. Employers may consider giving typhoon or rainstorm allowances as an encouragement if your FDH are willing to work in times of typhoons and rainstorms. Provide employees with adequate facilities and equipment such as safety helmets and raincoats to ensure their safety at work. If you choose to let your FDH to go out for holiday under a possible typhoon No. 8, you should consider to let her leave home before the typhoon warning signal is no. 8 is issued (public transport services are still working) and understand that she may not be able to come on time due to actual difficulties. Be flexible. The employer should provide the FDH the urgent contact number, so FDH can inform the employer immediately if she cannot come on time because of any reason. When the black rainstorm warning is in effect, the road may be heavily flooded and the weather is bad. For the sake of the safety of the FDH, the employer should ask the helper to rest at home until the Black Rainstorm Warning is canceled. Unless the parties have agreed in advance of the relevant work arrangements.